In every coach's career, it is inevitable that they will at some point be faced with the wrath of an angry or overly aggressive parent. You might be faced with that parent who is convinced that their eleven-year-old son or daughter is cut out for the pros. Or maybe you have a belligerent parent terrorizing the other team's players from the sidelines. 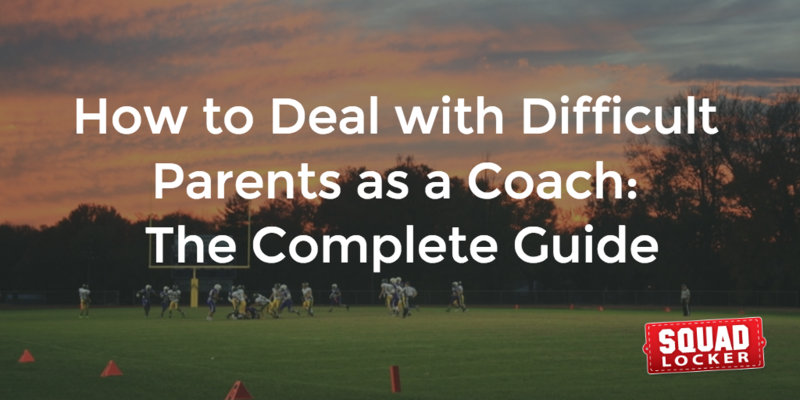 Whatever the case, fear not, as we have gathered up the most helpful tips for sports coaches to deal with difficult parents. If you take away anything from reading this, I hope it's this first piece of advice. A parent meeting can make or break your entire season. Some coaches simply send home a letter with their players after the first practice detailing the expectations and schedule, but nothing can really replace a face-to-face meeting. Hold a parent meeting and send the athletes home with the game and practice schedule and your contact information to hang on the fridge. Goals for the season - You should emphasize that the goal is to ensure that athletes are having fun, as well as teaching them the necessary skills so that they can improve their skills. Expectations for the players and parents - One of the most important parts of the meeting will be communicating what expectations you have for parents and their athletes. Other important information - Anything you want parents to know about practices, gear they may need to buy to participate, what you are doing for uniforms, practice/game times, etc. Starting off on the right foot with your players and their parents can make an enormous difference, and sets a precedent for the entire season. It also shows parents that you are approachable, and will encourage them to come to you if they have any problems later on. Try to hold this meeting before the first practice. This may seem like overkill, but parents will be more likely to actually understand and follow your expectations after reading and signing off on them. And we all know that nobody actually reads the team handbook. Your contract can be short and sweet, just make sure it outlines the expectations you have. Here is a great example of a contract specifically for the parents and athletes of a team to sign. Having this signed document makes it easier to approach any parents who are not following the contract later on in the season. Between the incessant questions and calls from parents, ordering team gear, waiting for parents to pick up their kids after practice, and organizing an end of the season banquet on top of coaching, it felt like you took on a second full-time job last year. If this sounds like you, or you're worried that you won't have enough time to do it all, designating a team parent could be a great fix. Many mothers and fathers would love the opportunity to help out and get more involved in their athlete's sport. They can help keep you organized and be a great touch point for other parents. If you're a high school coach, you will want to get to know the athletic department. Coaching a youth sport? It's a great idea to learn about the organization in charge. Introduce yourself to the administration, and make sure you are familiar with their policies and system for handling parental complaints. This is important because if a parent complains directly to the administration, you will want to be confident that the administration will send the parent right back to meet with you. Now that you have set your expectations, it's time to work on a plan for any damage control that may arise. The idea is that by taking those steps above before the season even starts, you have prevented most of the typical issues that crop up with parents in sports. But what if you happen to have that one crazy parent? This goes back to our first tip about communicating expectations to parents. It can be a good idea to add in game day rules, such as not allowing parents to bring up issues on game day. This is necessary because when this happens it can detract from the fun of the game, and puts you in an awkward position in front of other parents and players. Make an effort to check in with parents at different points throughout the season. Even simply greeting them when they come to pick up their athletes from practice can go a long way. This will make them feel comfortable enough to speak to you if anything comes up that could escalate to a bigger problem down the road. Ideally, you can set up a meeting for the next day or later to give them enough time to cool off. This one-on-one should be in private, unless you have an assistant coach who can sit in on the meeting as well. It can be useful to have a second person not only as a witness, but to provide another objective perspective on the issue. Always hear them out, and keep the focus on the kid. Thank them for sharing their concerns when they leave. At the end of the day, you have to have faith in your coaching abilities. Not every parent is going to agree with you 100% of the time, and that's okay. Believe in the system you have put in place, and stick up for yourself. At the end of every season, coaches are able to take a step back and reflect on what they have learned, what went well, and what they want to improve upon for next year. This includes your parent problem prevention plan! Make note of worked, what you might want to communicate up front to parents next year, or if there is anything else you wish you did that could have made the season go more smoothly. The fact of the matter is that parents play a pivotal role in any young athlete's enjoyment and continuation of a sport. In fact, there are college coaches who take into account the parents of their recruits; including their "sideline behavior to see whether parents are respectful of all players and coaches." This just goes to show the importance of parents in sports coaching. As a coach, hopefully now you can prevent ugly situations with parents by using the tips discussed above. Have friends who are coaches? Share the knowledge and save them from the wrath of difficult parents in sports!